So, I first need to apologize to our families that check the blog for updates. Busy is not an excuse, but goodness finding the time to get on the actual computer!! August 1st Jake started kindergarten. 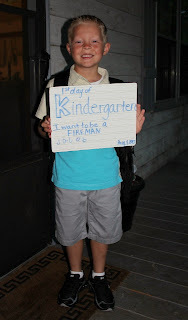 He had been in all day prek last year, but for some reason Kindergarten just seemed like such a big deal. He is in a big new school with all new people. And since our move he was going to a school where we really knew no one at all. 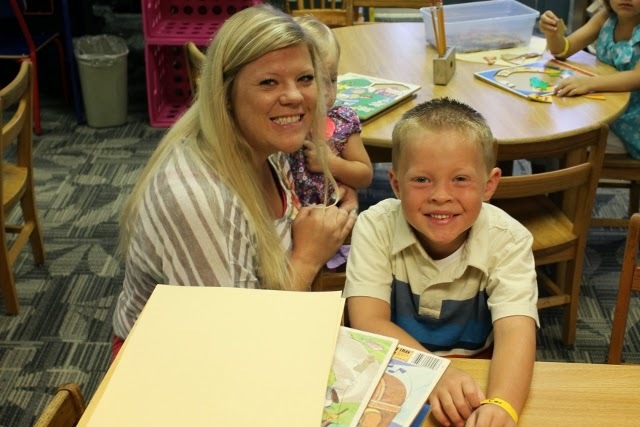 Jake couldn't have been more excited to be starting kindergarten. He loves it...his teachers love him and he is doing great!! We walked Jake to his class and he never looked back. He was more then ready for this new adventure in his life. It helped that we had gone a couple days before for his open house. He was able to meet his teachers and find his seat. It didn't make it any easier for me that he was starting Kindergarten. But I was able to hold it together until I made it back to the car before the tears came. Driving away with him there was so sad. And I think this was the longest day ever...I just wanted to pick him up & here all about his day. And he was so excited to hear all about his day and his new friends he had made.